It’s not clear where Imperial Recruiter’s ability fits in the current color pie, or in the current conception of design for search abilities. Note that the Forerunners from Rivals of Ixalan are not limited by cost or power but are limited by creature type, which means that you can search out something that might be exactly what your tribal deck needs, but generally not something that’s part of a famous combo or Vintage deck. The Recruiter’s power limitation is surprisingly not limiting, meaning that it makes cards like Dark Confidant, Academy Rector, and Mulldrifter even better than they already are. Considering that many of the creatures with power two or less are among the best of all time, that’s pretty impressive for a seemingly simple card from Portal Three Kingdoms. 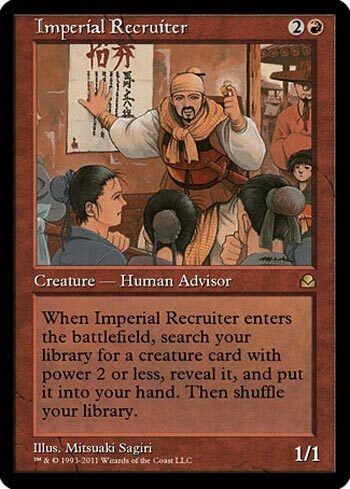 Imperial Recruiter is one of those cards that has gotten better with age. Creatures have become a lot more powerful in the past decade. Being able to tutor for a Snapcaster Mage, Stoneforge Mystic, or Tarmogoyf among thousands of other creatures is certainly a strong ability. In constructed Imperial Recruiter is a combo piece, in Limited he can help boost your board, in Commander, especially with Alesha, Who Smiles at death, you can dig through your massive deck for that single card you need. Imperial Recruiter is a subtly powerful card if used in the right hands. The reprint of Imperial Recruiter in Masters 25 is certainly a welcome one, as it’s a unique effect that has no real and ready replacement. Being able to fetch a creature with power 2 or less has a lot of combo-tastic implications in decks like Legacy Painter, a deck that aims to combo off with Grindstone and Painter’s Servant. Its major use is to enable degenerate decks to be more degenerate, but it is possible to use this “fairly” (though where’s the fun in that?). It’s a much-needed reprint of a potent combo piece, but it’s usable in casual decks with a particular combo piece to synergize with.